The biggest gangster of all, he made many people offers they couldn't refuse. Illegal booze and other rackets were his stock-in-trade; tax evasion was what nailed him in the end. 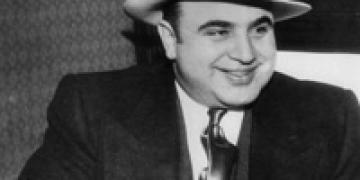 Many New York gangsters in the early twentieth century came from impoverished backgrounds, but this was not the case for the legendary Al Capone. Far from being a poor immigrant from Italy who turned to crime to make a living, Capone was from a respectable, professional family. His father, Gabriele, was one of thousands of Italians who arrived in New York in 1894. He was thirty years old, educated and from Naples, where he had earned a living as a barber. His wife Teresina (Teresa) was pregnant and already bringing up two sons, two-year-old son Vincenzo and infant son Raffaele. The family moved to a poor Brooklyn tenement where Alphonse Capone was born on 17 January 1899. The young Capone’s home was far from salubrious. He lived in a squalid tenement, little more than a slum, near the Navy Yard. It was a tough place given over to the vices sought by sailor characters that frequented the surrounding bars. The family however was a regular, law abiding, albeit noisy Italian-American clan and there were few indications that the young Al Capone would venture into a world of crime and become public enemy number one. Certainly the family’s move to a more ethnically mixed area of the city exposed the young Capone to wider cultural influences, no doubt equipping him with the means to run a notorious criminal empire. But it was Capone’s schooling, both inadequate and brutal at a Catholic institution beset with violence that marred the impressionable young man. Despite having been a promising student, he was expelled at fourteen for hitting a female teacher and never went back. It was then that Capone met the gangster Johnny Torrio which would prove the greatest influence on the would-be gangland boss. Torrio taught Capone the importance of maintaining a respectable front, while running a racketeering business. The slightly built Torrio represented a new dawn in criminal enterprise, transforming a violently crude culture into a corporate empire. But when he left for Chicago it was a criminal of a completely different breed who would first employ Capone as an eighteen-year-old bartender and bouncer. Frankie Yale was originally from Calabria. He built his turf not through astute diplomacy like the ‘gentleman’ Torrio, but on sheer brutality. Yale opened up a bar, the Harvard Inn, on Coney Island and gave the softly spoken Capone his first job and introduced him to violent crime. It was whilst doing his bar job that Capone received his famous facial scars after gangster Frank Gallucio took exception to a lascivious remark Al made to his sister. Gallucio pulled a knife on the enraged Capone. Later, Al was forced to apologise to the aggrieved man. The incident was to teach him not only to restrain his temper but also, as boss Yale impressed upon him, how to run a loan sharking, pimping and ‘protection’ business with brutal force. Despite a brief hiatus when Capone married middle-class Irish girl Mae Coughlin and settled down as a bookkeeper, he was soon to return to working for his old boss Johnny Torrio in Chicago. The unexpected death of Capone’s father was a turning point. It is believed that the sudden freedom from parental influence was the reason that he stopped trying to maintain a law abiding, respectable lifestyle. In 1920 Chicago arrived in Chicago, a corrupt, wealthy city known for its sexual promiscuity and gaming. When the local big shot "Big Jim" Colosimo was assassinated in his own nightclub, Torrio stepped into his shoes, overseeing the vast empire he had helped to build up. The act of Prohibition simply added to the fortunes gained from whorehouses and gambling dens. As Capone’s reputation grew he still insisted on being unarmed as a mark of his status. But he never went anywhere without at least two bodyguards. He was even sandwiched between bodyguards when travelling by car. He also preferred to travel under cover of night, risking travel by day only when absolutely necessary. With his business acumen, Al became Torrio's partner and took over as manager of the Four Deuces - Torrio's headquarters in Chicago’s Levee area. The Four Deuces served as a speakeasy, gambling joint and whorehouse under one roof.